It's lunch time here in my little corner of the world so I'm going to keep this post short. I forgot to eat breakfast so I'm starving! 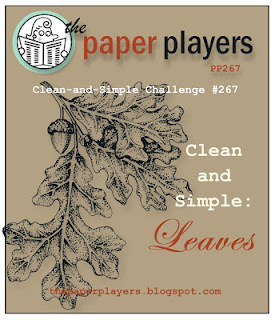 But, I wanted to share with you the card I made for The Paper Players Challenge and the Colour Me...! Challenge. The theme is leaves and the colors are perfect for fall. Well, the Watermelon Wonder is pushing it for a fall color but there are some leaves that do look a bit like it. Sometimes when you pick up a leaf, it will have little nubs on it so I added the pearls for a bit of dimension as well as to reflect those little bumps. :-) At least my bobble head scarecrow is smiling! Stamp Sets: Butterfly Basics (background), Happy Scenes (sentiment); Inks: Crumb Cake, Basic Black Archival; Cardstock: Elegant Eggplant, Pumpkin Pie, Very Vanilla, Watermelon Wonder; Accessories & Tools: Assorted Leaves Dies (Darice), Pearl Basic Jewels, Very Vanilla Thick Baker's Twine, Glue Dots, Dimensionals, SNAIL Permanent Adhesive, Stampin' Trimmer, Big Shot Die-Cutting Machine. All Stampin' Up!® product unless otherwise noted. The theme I used is from The Paper Players Challenge. Such a beautiful and elegant card, and I love the non-traditional colors for an autumn card. Your little bobble head scarecrow is adorable, too! Thanks for playing along with The Paper Players this week, Marsha! Thanks, Sandy! I'm always on the look out for something different to use in my light tent. I found the little scarecrow at the dollar store and fell in love with him. Loved the theme for this challenge. Fall is my favorite time of the year. What a fabulous CAS card!! 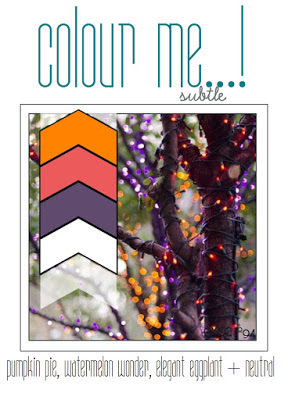 Love the leaves in this week's challenge colors- thanks for playing along with us at Colour Me! Thanks, Julie. Loved the colors. Thanks, Ren! It was a great color scheme to use. 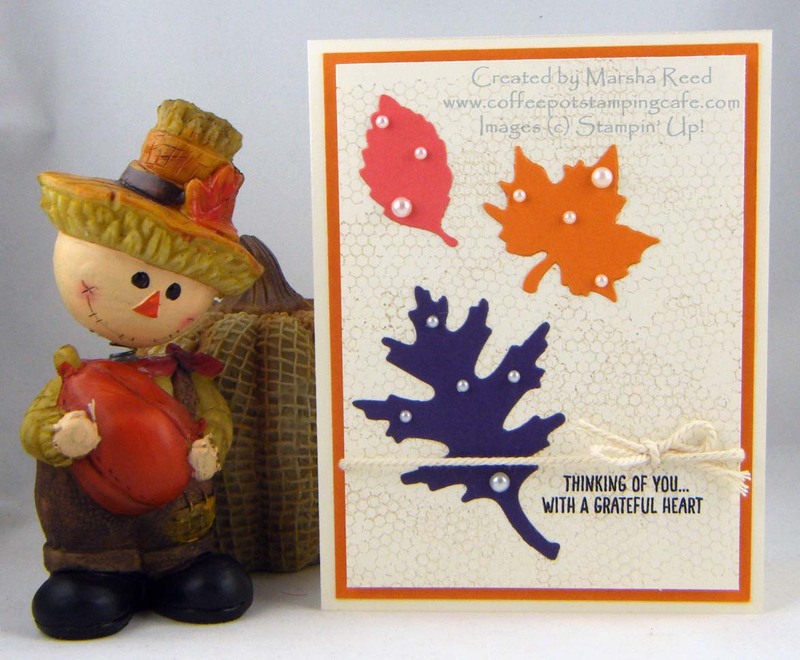 Such a lovely autumn card, Marsha! Great use of our palette. Love your tiny pearls all over the leaves. Thank you for joining us at Colour Me this week! Thanks, Valentyne! I love fall and the colors for the challenge worked perfect for the leaves.